Home » News » Harry and Meghan to visit Fraser Island! 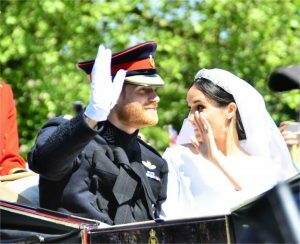 Harry and Meghan to visit Fraser Island! Their Royal Highnesses The Duke and Duchess of Sussex will visit Queensland in October and Fraser Island (K’gari) is on their list. Our social media is aglow with an impending royal visit to our own backyard. Judging by the comments, it may mean the barge will be busier than usual. Conveniently, Monday, October 22 co-incides with a pupil free day in Queensland – plus it is the same weekend as the 4×4 Pink Run at Teewah Beach and Rainbow Beach’s own Arty Ball. Our readers want to know how they will be able to see them. I am keen to find out if they are up for our Great Beach Drive via Rainbow Beach, or perhaps they will fly straight to the island. Their Royal Highnesses will visit Fraser Island (K’gari), home of the Butchulla people, one of Australia’s dedication to the Queen’s Commonwealth Canopy initiative. The Queen’s Commonwealth Canopy is a Commonwealth-wide initiative to preserve forests. Premier Annastacia Palaszczuk has welcomed the visit. “We are honoured and delighted to receive Their Royal Highnesses The Duke and Duchess of Sussex, and I’m sure many Queenslanders will be excited by the news and will offer a warm Queensland welcome,” the Premier said. The visit to Queensland by The Duke and The Duchess is part of a wider Australian visit that also takes in the Invictus Games in Sydney in October. The Duke and Duchess of Sussex will undertake an official visit to Australia, Fiji, the Kingdom of Tonga, and New Zealand. The visit will take place between Tuesday 16th October and Wednesday 31st October. Physio and Podiatry come to Rainbow Beach!